Which is the most bombed country in the world? During the Vietnam War, more bombs per person have gone down on Laos than on any other country in the world. And the United States never even officially declared war to Laos. But they kept bombing streets in the country to cut off supply roads for the Vietcong. Plus, Laos was a drop-off zone where pilots could freely drop off their unused bombs before landing. These days, almost eighty million unexploded bombs remain in the country. Thousands of people have gotten injured in accidents involving unexploded ordonance. Farmers can’t fully use their land because it is contaminated. Development is halted because areas have to be cleared from bombs first. The COPE Visitor Centre gives a good overview of Laos’ tragic past and its influence on the present and the future. Ask about the videos that the staff will play for you on demand. Also, while entrance is free, you should consider leaving a donation for the victims of unexploded ordonances. 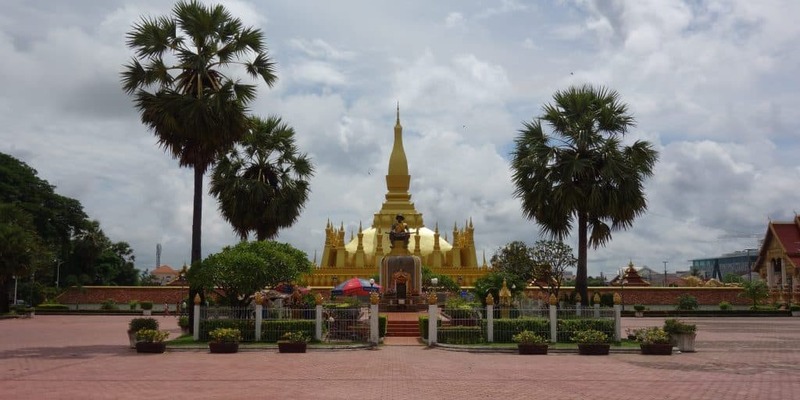 When we went to Pha That Luang, the golden stupa, one of Vientiane’s main tourist attractions, was under renovation. We took a look at it getting painted with a fresh layer of gold, then went to explore the surrounding temples. Those alone made the visit worthwhile. Huge temple complexes spread out on both sides, with beautiful temples, buddhas and paintings for you to explore. Do you like crickets and mysterious banana leaf packages? If yes, you should head over to the night market. If not, I still recommend you come here. There are plenty of other food options available. 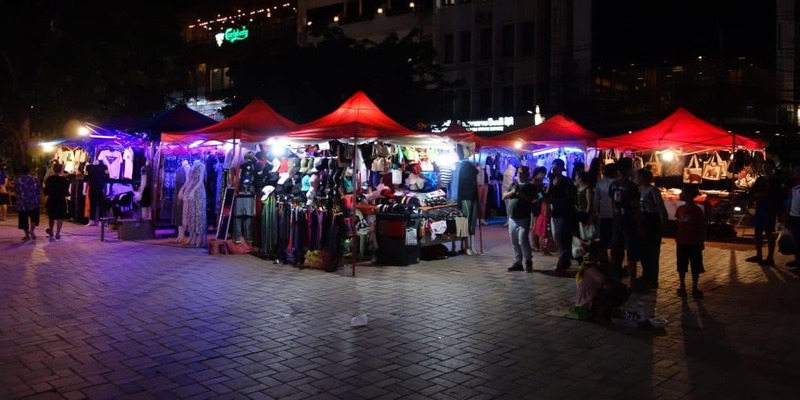 Separate from the food night market, you can find a night market along the river. Here, you can buy clothes, souvenirs, phones, SIM cards, toys, shoes and pretty much everything else you might need. It is a busy market, with lots of locals around. If you get tired, grab some ice cream and sit down next to the river. Wat Si Saket is the oldest temple still standing in Vientiane. The temple grounds are simple but worth visiting. 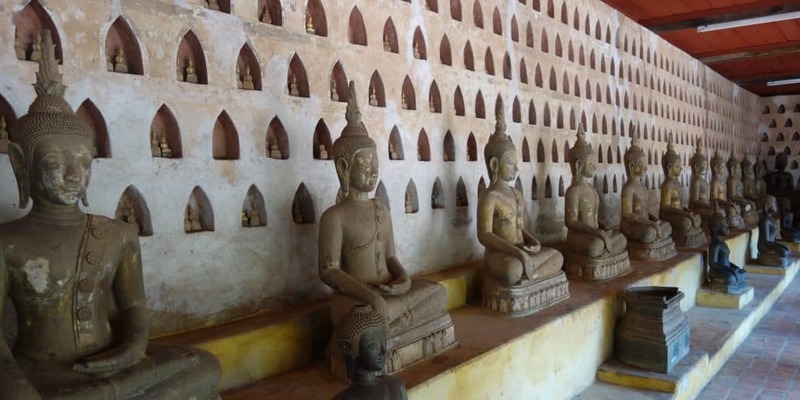 The interior is beautifully decorated and along the courtyard walls, you can find hundreds of Buddha statues. 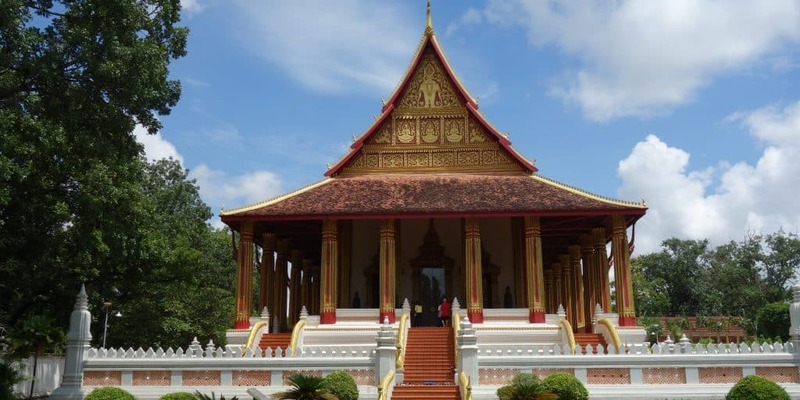 Located almost opposite Wat Si Saket, this is another beautiful temple in Vientiane. While its origins date back to the 16th century, the temple has been rebuilt a couple of times. Inside, you can find a museum of Buddhist art. The collection isn’t huge, but the building is worth visiting for its beautiful architecture alone.